ke is a software package of development solutions, which empowers everyday users to easily create friendly websites and manage web content performance with the use of predefined templates. Development solutions from ke puts you in the driver's seat with useful features of development maintenance such as easy to manage dynamic content, custom data configuration, easy tool for custom error handling and automatic feedback, message boards, calendar, random content, newsletters, and much, much more! This engine of development solutions allows for nested dynamic content, rotating pages, calendaring and schedule display, embedded message boards, shopping cart, feedback forms and many other. The ke Mission is to radically change the Internet experience for everybody by empowering website owners with cutting-edge web engine, simple to deploy and maintain, easy to expand, which will transform e-visitors in e-regulars. We encourage the growth of the Internet, by providing dynamic intelligent websites. Furthermore, we will research and develop the latest in technology and implement these solutions into ke™ exceeding our client's expectations. ke is a revolutionary new friendly websites creating system. It is built, from the ground up, offering development solutions for the rest of us. From now on website development is easy even if you know nothing about code, nothing about html or any of that other stuff. With ke's development solutions you can still build and manage your own friendly websites. What is ke website engine? With a high pricetag on complete dynamic solutions, many companies have opted to invest in websites that have no practical website maintenance. 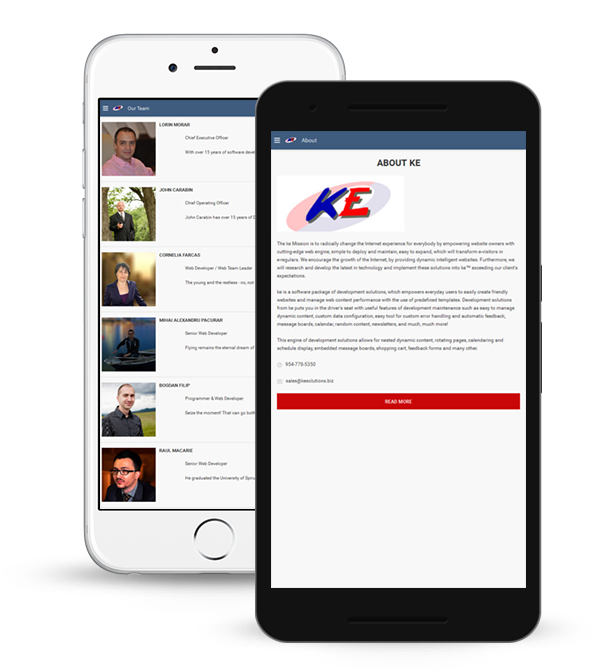 ke™ is designed to allow companies their own website content management and access to rapid development. Since ke™ is 100% database-driven, there are no static pages, and content sections are easy to add or edit. If you can cut and paste, you can update content on the site, that's how effective ke website engine is! Website content management is no longer a problem. Most website content management models (systems of content delivery) that are currently available accommodate only typical content fields such as "Title", "Description" and "Date." However, the rapid development ke™ website engine enables content within each section to match industry specific logic. This means that your website content management will include various types of data available on ke. Our website engine custom fields can accept and search any type of data, as are found in the real estate or health care industries in order to provide rapid development. ke™ website engine supports expansive set of features for best website maintenance with dynamic solutions. These features include product directories, business directories, discussion forums, e-newsletters, shopping carts, discount coupons, rating systems and more. ke™ website engine is offered at a price point that is accessible to small and medium businesses. You pay only for ke website management features that you use so you can start small and expand from there. ke™ is introducing a powerful feature called snippets. Snippets are reusable pieces of code that can be nested to provide entire web page. Reusable code allows you to rapidly deploy new functionality on your website without need for complex coding. With snippets functionality, it is easy to cascade changes through website maintenance only in certain areas of your website. We believe ke is one of the next generation web tools that will revolutionize the internet. Therefore, it is only natural to do everything within our power to spread the word about it. We provide training to web designers and web developers interested in becoming part of our team. ke Solutions offers resources, support and a plethora of services in website development, design and branding. We believe the virtual world should be less confusing and have a better information and resources quality and we actively support that by enabling ‘the inhabitants’ of this virtual world easy access to reliable resources as well as the possibility to build complex dynamic websites and manage large amounts of information and content. All this, using an incredibly easy to use and inexpensive solution. ke Solutions designs websites that focus on usability and maintainability. This means that our web engine makes it easy to plan your website, to implement policies and procedures, to add new pages and services and to implement or change your overall web structure. Once completed, your website will be easy to use, easy to navigate and easy to update. Both your administrators and your users will find information and products easily and quickly. What is more, we continue to work hard at perfecting our planning procedures, our product solutions, our security policies and at the overall stability and reliability of our software. All that is coupled with an always elegant, trendy and compelling website design and branding created just for you. As the Web moves away from being the "cool new toy" to becoming more and more a resource for information and research, website ideas and designs must adapt accordingly. Website design must support your message, rather than overwhelm it. In other words, web design tends to become more practical and targeted to specific needs and interests. Today, the average web surfer is less tolerant to distractions and usually eager to make the best of his online time. Visual toys such as animation and sound must be used only when the content or product warrants it, rather than as useless (and often annoying) decoration. While it is true to say that today the web is merging with traditional television and an important part of the web is geared towards entertainment, insofar as access to information and research are concerned, the core responsibility of website design is to make such activities easily accessible. Additionally, e-commerce is about meeting the needs of diverse customers quickly. Simplicity, ease of use and intuitive navigation are powerful website design traits that enhance the customer experience and has a return on your bottom line as a business owner.